Reduced in price by $10, and expanded in page count, this new, expanded edition, includes more than 15 detailed practice hands, with special emphasis on tournament play and the new tournament structures. It includes more than 25 new card illustrations. Clearly-written strategies and powerful advice show players the best starting hands, strategies for the flop, turn, and river, how to recognize dangerous draws, win at low-limit and high-stakes games, play against loose and tight opponents, and the differing strategies for rebuy and freeze-out tournaments. Players learn the best starting hands, when slowplaying a big hand is dangerous, what danglers are and why winners don’t play them. Pot-limit Omaha is the only poker game where you sometimes fold the nuts on the flop and are correct in doing so—players will learn why! 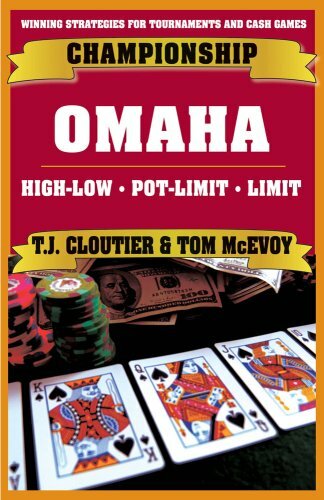 This new edition includes added strategies on how to capitalize on Omaha high-low in multi-game events, building on Cloutier’s first-hand experience at the final table of the inaugural $50,000 buy-in H.O.R.S.E. tournament at the World Series of Poker.